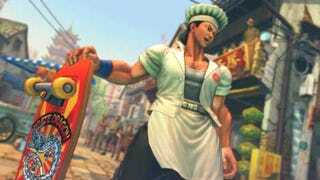 Super Street Fighter IV's Yun And Yang Also Delivering To Consoles? Capcom's official Japanese-language blog posted a few screens of new characters Yun and Yang in their Arrange Costumes, where they change from a mere skateboarder and rollerblader into a skateboarder chef and a rollerblader waiter. Additionally, EventHubs got a tip that new achievements for Super Street Fighter IV on the Xbox 360 show Yun and Yang coming to the game's console version. (They're confirmed only for the arcade version, which releases in Japan next month.) This batch also shows an Evil Ryu. Grain-of-salt territory: I have no idea of these images' authenticity. But it's not too much of a stretch to assume Y&Y will come home at some point.